The creations of Christian Lacroix embody in spectacular combinations his Provençal roots, his passion for folklore, and his fascination with the history of clothing. His artfully unexpected mixtures express a new form of luxury, simultaneously youthful, baroque, and sophisticated. Lacroix mingles bright tones and extravagant materials in creations that express a refined blending of different cultures; distant and forgotten costumes form the basis, if not the raison d'être, for his work. Christian Marie Marc Lacroix was born in 1951 in Arles, France. In early childhood Lacroix showed a flair for design by putting together little albums on theater and opera, collages assembling family portraits, and reproductions by Christian Bérard. He left his native Arles to study the history of art in Montpellier, and then enrolled at the Sorbonne in Paris in 1973. He wrote a master's thesis on French costume in the paintings of the seventeenth century while at the same time taking courses at the École du Louvre to become a museum curator. It was at this time that he met his future wife, Françoise Rosensthiel; they married in 1974. With the encouragement of his wife, he soon turned to fashion design. In 1978 he joined Hermès, where he learned the technical aspects of the profession. Two years later he was an assistant to Guy Paulin and then succeeded Roy Gonzales as a designer for Jean Patou in 1981. In 1986 he received the Golden Thimble award for dresses designed in honor of his native region of Camargue. In December 1986 Lacroix met Bernard Arnault, chief executive officer of the multinational luxury firm Louis Vuitton Moët Hennessy (LVMH), who offered him the financial support needed to open his own couture house. The Christian Lacroix house was inaugurated in 1987 at 73, rue du Faubourg Saint-Honoré in Paris. On 26 July 1987 Lacroix presented his first collection under his own name, and that year the Council of Fashion Designers of America awarded him the prize for Most Influential Foreign Designer. Inspired by dresses in the style of the 1880s, he designed an off-the-shoulder dress with a high waist, the miniskirt of which became the emblematic "pouf." Completed by a short bolero jacket, the ensemble was cut in highly colored and decorative fabrics inspired by Provence. Folk and traditional elements were set off by a certain French grandeur, coquettishness, and whimsy that reflected the desires of a new generation hungry for luxury. Lacroix's style thus confirmed the taste for a typically southern opulence, instilling new life into French haute couture, which had been stigmatized as a dying art. France Soir described Christian Lacroix as the "Messiah," and Time featured him on its cover. In 1988 the profession awarded him a second Golden Thimble. The dream collapsed with the stock market crash. The pouf soon became a metaphor for the excesses of the 1980s, which gave way to the minimalism of the 1990s. In his designs, Lacroix nevertheless remained faithful to his roots and his history in a clothing collection where east meets west, the north basks in the southern sun, and the past blends with the future. The 1980s had allowed him to define and focus these influences, and over the years he continued to quote from and vary his sources of inspiration, as he developed and refined them. Lacroix also carried on using a glittering palette of colors. "Colors I have always liked, so much so that when I was a child, I dreamed of swallowing tubes of yellow and vermilion paint," he said (de Bure, p. 129). His designs became more abstract and the dresses more simplified, their architecture more apparent. Previously, the decoration had been designed before the dress; now it came into play only after the dress had been constructed. "In reality, I love only what veers off course, has a defect, is heterogeneous, transitory," he said. "I think I love everything and its opposite. That is probably the key" (du Bure, p. 130). Lacroix has turned his fashion world into a stage, designing for more than twenty ballets, operas, and plays. In 1996 he was awarded the Molière for best costume design for the Comédie Française production of Phèdre. In 2000 he signed a new contract with LVMH, the owner of his couture house. He divides his time between his responsibilities as artistic director of this couture house and his own company, XCLX. The list of his projects is long and varied and his commissions ever more spectacular. Among his extravagant designs are eight carriages of the TGV Méditerranée (a high-speed French train), which he "dressed" and presented as haute couture creations. "This is what now interests me: going beyond fashion to participate in ways of living, in our global environment, with uniforms [for Air France], seats for the TGV, stage costumes. Each of these areas-clothing, theater, design … helps me to express a facet of my personality" (Brébant, p. 61). Spectacle is inherent to his vision: "The Lacroix woman is staged in a theatrical fashion. She is not afraid of being noticed; for her one can imagine nothing that is bland (Alessandrini, p. 22). In 2002 Lacroix was named artistic director of the Florence ready-to-wear house Emilio Pucci. That year he was awarded the medal of Chevalier of the Légion d'Honneur. Lacroix describes French haute couture as "eternally dying and paradoxically constantly being reborn from its ashes" (Sausson, p. 6). A great defender of couture, Lacroix does not conceive of it as an art but rather as a service rendered to his clientele: "Art is something made for love. Art is what makes life more beautiful. Something that motivates and inspires. My work has a purpose; it is not just made for the sake of it" (Lowthorpe, p. 14). His creations, brought into being by a wide range of craftsmen, knitters, corsetieres, painters, and embroiderers, overwhelm and plunge the spectator into a world located between dream and reality, where fantastic textures rival embroidered materials in elegance, where fluid fabrics wedded to richly colored costumes speak in a flamboyant vocabulary signed Christian Lacroix. See also Art and Fashion; Ballet Costume; Haute Couture; Paris Fashion; Emilio Pucci; Theatrical Costume. Alessandrini, Marjorie. "Christian Lacroix: La mode est un théâtre." Le nouvel observateur. 12-18 July 2001, p. 22. Brébant, Frédéric. "Christian Lacroix relance la Puccicmania." Weekend le Vif/L'Express, 28 February 2003, p. 61.
de Bure, Gilles. 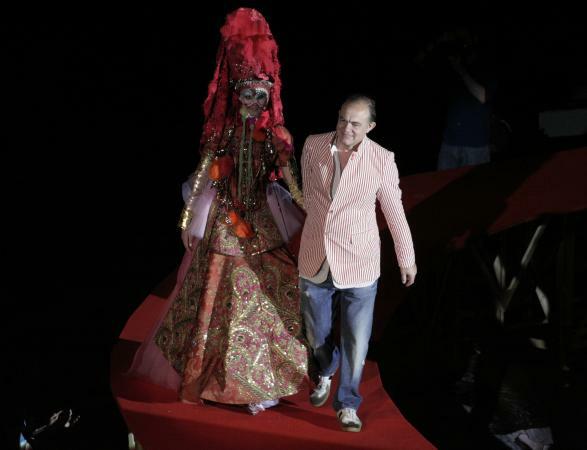 "Christian Lacroix, l'homme qui comble." Technikart 28 (December 1998): 129. Lowthorpe, Rebecca. "Christian Lacroix." Independent on Sunday, 1 July 2001. Sausson, Damien. "Christian Lacroix, au-delà de la beauté." L'œil, September 2000, p. 6.